In the course of 54 weeks in hospitals, a nursing home, and an assisted living facility there were various family photos with her at different times. But this one never left her side. My mom was, among other things, a rank and file activist. She worked in a non-union hospital, helped form an organizing committee, met for years, and finally got the union to come in and try to organize (that one didn’t end so well. After getting fired for organizing activity, she won her NLRB case, but lost, on appeal, an unfortunately common outcome). She worked at Yale, clerical, when clericals and technicals organized. She was an active part of that drive. And they won. And she came to Harvard after the clerical union was recognized, but before the first contract. Harvard administration was trying to sell the load of bull that a contract would make things worse for the workers. My mom spoke to one department after another, explaining how having the contract had made a difference at Yale. A lot of people worked hard on that vote, and they won. My mom stayed a rank and file activist for the rest of her career, playing a leading role in solidarity campaigns with other unions. It makes sense that she chose to keep this photo with her during her recovery. 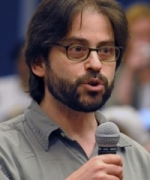 It’s a photo of me, speaking about solidarity, at a United Federation of Teachers Delegate Assembly a decade ago. Love love love this. Thank you for sharing this storing.